A Sputnik correspondent in France is attending the protests in Paris. The French government's spokesman, Benjamin Griveaux, announced earlier that Operation Sentinelle troops would be redeployed to protect public order at the Yellow Vest demonstrations expected on Saturday. These forces patrol streets and protect airports, train stations, places of worship and other sites; they were mobilised for anti-terrorism protection after the 2015 terrorist attacks. French President Emmanuel Macron stressed that the soldiers would not be engaged in keeping public order. Last Saturday's protest left Champs Elysees in Paris in tatters. The government fired Paris police chief Michel Delpuech and promised bans on demonstrations in certain areas, naming Champs Elysees and Capitol Square in Toulouse as examples. The prefecture of Haute-Garonne has already reportedly banned protests in Capitol Square this Saturday. According to videos from the site, a policeman has been injured as a result. According to the BFMTV broadcaster, police were forced to use tear gas against Yellow Vests protesters at Boulevard de Strasbourg in Paris as the latter were putting bins on fire. 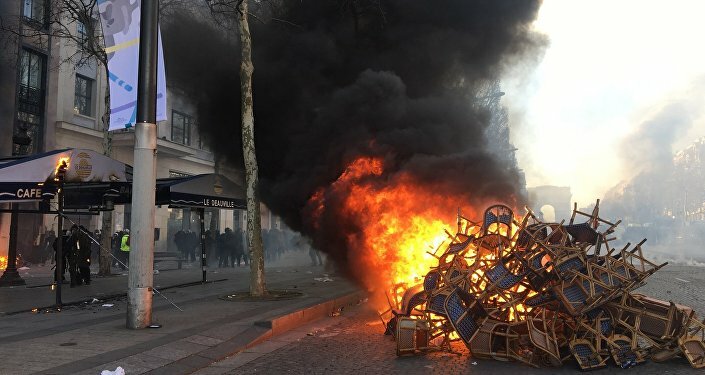 🔴 #ActeXIX - La manifestation sauvage des #GiletsJaunes se poursuit avec de nouvelles poubelles en feu boulevard de Strasbourg à #Paris. Mis à part la vitrine d'une banque, aucune boutique n'a été vandalisée. The French Interior Ministry informed that as of 02:00 p.m. local time, some 8,300 people participate in the Yellow Vests protests in France, including 3,100 in Paris. Twitter users claim that former French presidential candidate Jean-Luc Mélenchon was spotted at the protests. According to the latest data from BFMTV, the number of people detained during protests has climbed to 51. Social media users claim that Yellow Vests protests, following the route agreed with the authorities, have started. Some areas of Paris have been banned from rallies after last weekend's rioting. French law enforcement detained over 30 people Yellow Vests protesters in Paris, France Info reports. Meanwhile, BFMTV reports that at least six people were detained during protests in Nice. 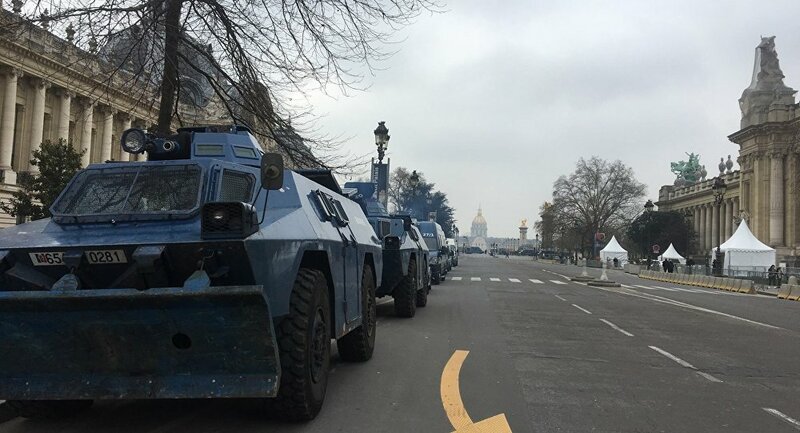 According to Sputnik France, police has deployed about 6,000 police forces, water cannons, armoured vehicles and a device to dismantle the barricades to the centre of Paris. Despite the ban by the authorities, Yellow Vests gathered for a demonstration in Nice. As a result, a woman was seriously injured near Garibaldi Square, France 3Côte d'Azur reported. #ActeXIX #Nice - Femme blessée à la tête: @RTLFrance écrit qu'un "grand nombre" de policiers ont chargé les #GiletsJaunes, et que la manifestante a été blessée suite à cette charge.